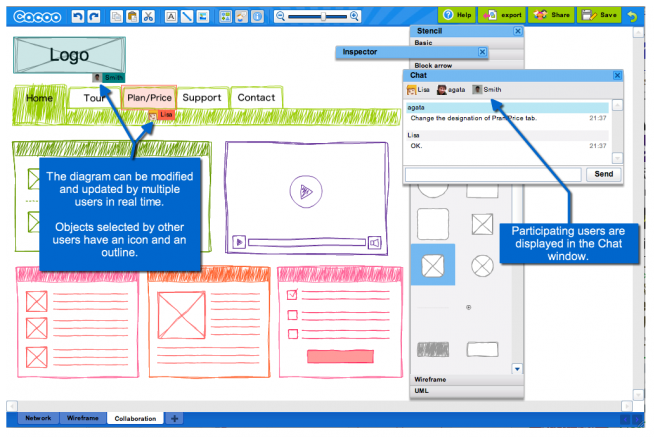 CACOO – Create diagrams online with Real time collaboration!! Cacoo is a user-friendly online drawing tool that allows you to create a variety of diagrams such as site maps, wire frames, UML and network charts, and the best thing is, it is FREE OF CHARGE!! Developed by Japan-based Nulab, the Flash application is entirely browser-based, free and available in English (and Japanese). Cacoo features a library of icons users can drag and drop to create site maps, wireframes, flow charts, network diagrams, mind maps, UML diagrams, and more. Much like similar tools, Cacoo users can align the design elements to each other, resize, flip and skew them, create their own components from existing ones, upload images to include in the diagrams, and more. – quoted from TechCrunch. The major selling point of Cacoo is that you can share the diagram you created with your colleagues or other people. Your colleague can then modify your diagram and you will be seeing what they change in real time. It also has a chat feature which make communication easy. I myself has played around with it, it is great, smooth and very intuitive.